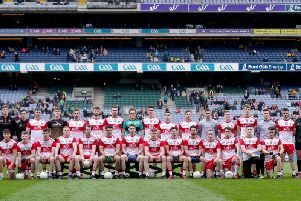 Doire Trasna completed the league and championship when they defeated Limavady for the fourth time this season with an eventually comprehensive eight point victory, a crowd of 1804 in Celtic Park to witness that feat as well as minor titles for Ballinascreen and Glen. To the raucous refrain of ‘Championes, Championes, Championes,’ the Joe Brolly Cup ‘was hoisted into the early evening air at Celtic Park as the delirious Pearses’ players celebrated wildly in the presentation area of the Tommy Mellon Stand to the delighted cheers of their of cheering supporters in the stand and those who were milling excitedly around out on the pitch in front of them. All the while, contented Trasna manager, Paul Simpson, was quietly watching on proudly as the players and supporters celebrated the magnificent success in harmony. And a few metres away, amidst all this happy pandemonium, a dejected Wolfhounds manager, Mickey Boyle, stood forlornly among his disconsolate players after another poor Limavady performance had made life far too easy for an outstanding Trasna team as they racked up a league and championship double, promotion to Division 2 and the Neal Carlin Cup to complete a clean sweep of 2017 trophies. “In the championship, goals win games and both our goals were crucial scores at crucial times,” explained Simpson, “The first, a fisted one from Cormac Carlin in the third minute, gave us a huge start. The second in the 22nd minute, a blistering strike by Micheál McNaught, came after Limavady had fought back to level at 0-5 to 1-2. When it was most needed Trasna had some fantastic displays from key players all over the pitch, Eoghan Carlin was poised and confident as a sweeper behind the full back line, Conor Houston quite magnificent at left half back with his dangerous and penetrative raids on the flank; Colin Murray (0-6), Micheál McNaught and Cormac Carlin (1-1 each) in an outstanding attack. “I thought our half back line was exceptional, with Eoin (Carlin) in tremendous form against a potentially dangerous Limavady attack,” added the Pearses manager. “We were well aware that Limavady were a big threat up top. Big Cormac (Quigley) is a very good player and we were well aware that if he got enough ball he would do damage. So we set out to try and prevent that from happening. “I thought our half back trio played really well. “There was a real tussle at midfield but I thought we eventually came out on top in that contest. Up front Colin Murray was exceptional but the substitutes also all made a telling contribution and that’s what championship football is all about. “I’m really delighted with the overall performance of the players and the team. This is massive for us as a club. We set out at the start of the year with the target of getting promotion but once we reached the final, we wanted so much to win the championship. “Limavady put in a huge effort in the first half and it was nip and tuck but the goals were decisive. And when the space opened up in the second half, we really used it well. A visibly distraught Limavady manager Mickey Boyle showed great composure and sportsmanship in the immediate aftermath of this eventually crushing final defeat at Celtic Park. “Obviously I am very disappointed at the defeat but on the day the best team won,” said the magnanimous Wolfhounds boss. “The two goals in the first half were real sucker blows. I thought that for most of the first half we were every bit as good as Pearses. But when they came out after half time and scored four points in a row to extend the lead to 2-6 to 0-6, we had to chase the game. Limavady trailed by two points at half time but were still well in contention but the Wolfhounds manager had stressed to his players during the interval the critical nature of a good start to the second period. “They were able to build a platform and we could not get back into the game. When Pearses scored their second goal to move 2-2 to 0-5 ahead it looked as if they had weathered the Wolfhounds storm that had yielded points from King (2), Ruairi O’Kane and a Cormac Quigley pointed free for 0-5 to 1-2 ten minutes from half time. Still Pearses were good value for their 2-2 to 0-6 interval lead and they put paid to any hopes Limavady might have harboured with a blistering third quarter. The irrepressible Murray hit three superb points inside five minutes, Micheál McNaught extending the lead to five points in the 40th minute. Eugene O’Kane and Murray exchanged points from frees by the midpoint of the half but Murray, from a free, Caolan O’Connell with a second point of the game and substitute Dee Starrett completed the victory, a late Limavady siege yielding just a point from Richard King. The best team won. They have been the best team all season. Simpson and Emmett Thompson have assembled a extremely talented group of players and, more importantly, got them functioning as a team. With a new pitch on the horizon, this victory could just be the start for Trasna.